Our flamingo gateway at Indian Mound campsite. The smiling kid is Sam Hotz, SPL, Eagle Scout, and current student at Baylor University. Some Troops rotate to several BSA summer camps over the years. But Troop 890 is not “some” Troop. 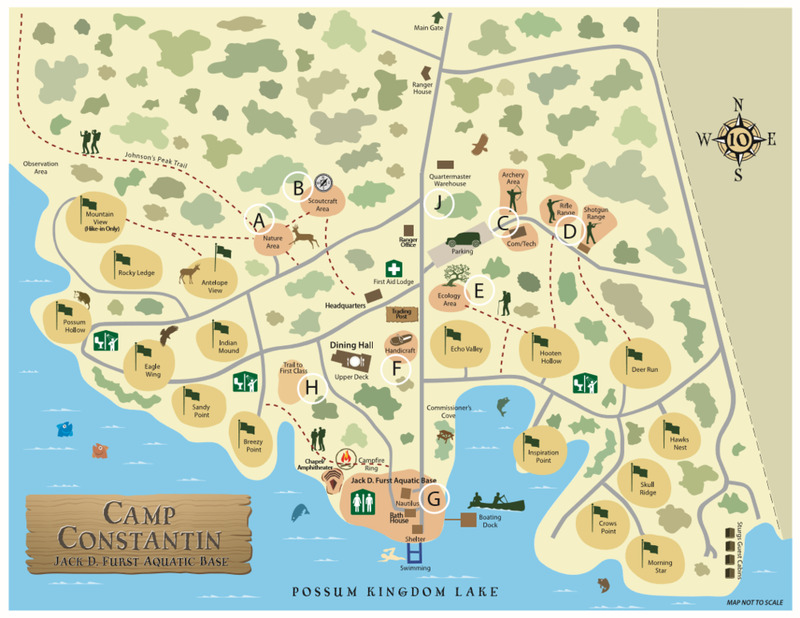 Troop 890 has made Camp Constantin our home away from home. For over 40 summers in a row, we have invaded Constantin the 3rd week in June. We are big. We are loud. We have flamingoes. We have fun. We conquer the heat. Our First Years participate in the Brazos Buccaneers program which, in the mornings, helps them cover many of the skills needed for their early advancements. Each afternoon, instead of sending our First Years to the camp merit badge sessions, our own adults hold private classes for the Swimming and Canoeing Merit Badges only for our Scouts. This system makes sure that our Scouts get sufficient water and teaching time, and we usually have a 100% completion rate as a result. On Wednesday or Thursday, the First Years hike up Johnson’s Peak and sleep under the stars. We’re very much looking forward to starting our own girls’ traditions at summer camp! Scouts in their 2nd, 3rd, etc., years at camp take merit badges to help with rank advancement, leaving time for hanging out, napping, swimming, boating, playing Fat Bat, etc. 890 has 3 campsites each summer, with the First Years being in Indian Mound, the Second and Third Years in Eagle Wing, and the high schoolers in Sandy Point. Proving that we truly make Camp Constantin our home, every summer our adults perform a service project for the camp at our own expense. Some summers our project, due our limited adult availability, may be small, such as repainting campsite signs. Other summers, we have build 2 gaga ball pits; built the backstop for the Fat Bat field; built the covered dugouts for the Fat Bat field; and the list goes on. The pavilion behind our flamingo gateway (in the photo above) was paid for and built by Troop 890 many years ago. The pavilion below, which was also paid for and built by Troop 890 in Eagle Wing campsite, was dedicated to our former Scouter Norm Meador, who passed away shortly after “his” pavilion was completed in 2011. The Norm Meador Pavilion at Eagle Wing campsite. Our next summer camp at Constantin will be June 16-22, 2019. The cost per Scout will be approximately $325. 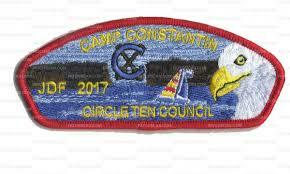 Circle 10 Council offers “camperships” to help defray the cost. The Troop can also help with costs on a need basis. Contact the Troop Treasurer for information. Summer camp signups will be at a Monday night Troop Meeting likely in late April 2019.